Mitosis can duplicate cells for growth or for reproduction, depending on the organism; meiosis only serves reproduction, and fertilization is its inverse. Cells of different organisms may spend different relative amounts of time in haploid and diploid states. Humans cells spend most of their time in the diploid state, going haploid only for the short period required for sexual reproduction. This is not true for plants. Biologists use the following terms to classify organisms by the relative duration spent in stages of their life cycle. haplontic – The organism’s life cycle is comprised of a dominant haploid stage. diplontic – The diploid stage is dominant (in humans, for example). haplodiplontic – The two stages alternate more or less equally (the case for most plants). The alternating stages of haplodiplontic organisms is called the alternation of generations. The following figure illustrates the heterosporous case. Alternation of generations (heterosporous)1Author’s work, based on Openstax BIology, itself modification of work by Peter Coxhead. We use the notation 1n for haploid and 2n for diploid, meaning one or two times the number, n, of chromosomes in the organism.2For humans, n = 23, of course. The steps in alternation of generations are the following.3Note that this discussion concerns land plants only. Fertilization of two haploid gametes produces a diploid zygote, which duplicates and grows by mitosis to form the sporophyte, the diploid multicellular form of the organism. 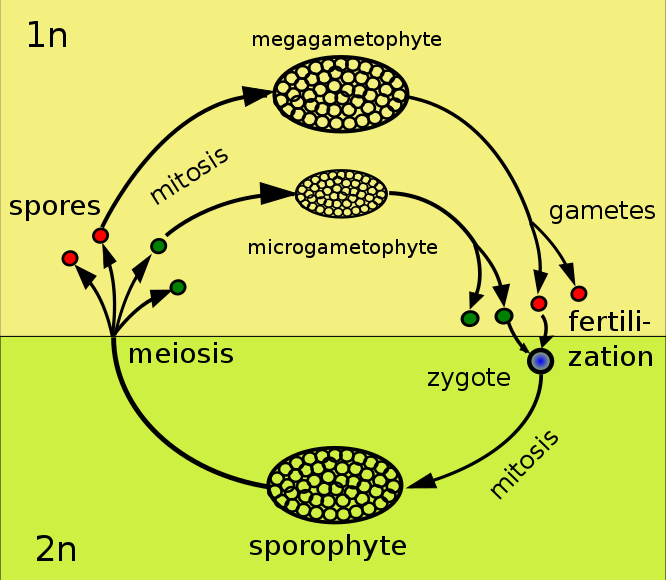 The sporophyte carries sporangia (spore-containing sacs), in which diploid sporocytes produce haploid spores by meiosis. The spores may be homosporous (containing male and female spores) or heterosporous (different spores for male and female). The spores grow by mitosis to form the haploid multicellular form of the organism, the gametophyte. In the case of heterosporous organisms, separate male and female gametophytes are formed. Inside the appropriate gametophyte, antheridia produce sperm and archegonia produce eggs, haploid gametes which join through fertilization to form the diploid zygote, bringing us back4“…by a commodius vicus of recirculation…” to the beginning of the cycle. Generically, antheridia and archegonia are called gametangia. In plants, multicellular individuals exist in both the diploid and haploid states, as in the above figure. In the life cycle of a diplontic individual such as a human, there are neither a gametophyte stage nor spores. 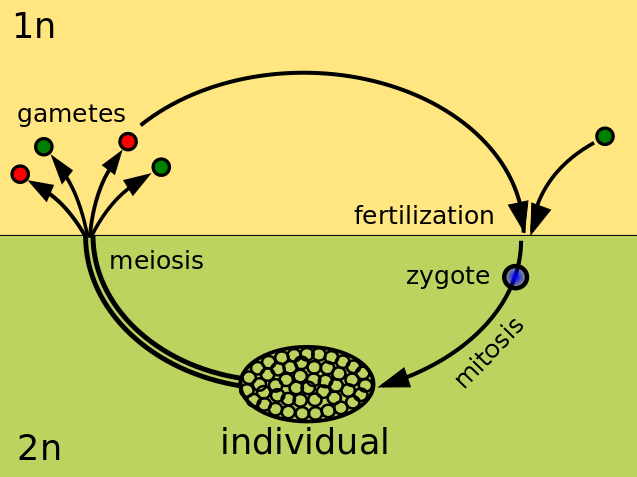 An individual produces gametes by meiosis, which are quickly fertilized (or lost) to become a diploid zygote from which a new individual will grow. Life cycle of diplontic individual.5Author’s own work. Plants vary in several significant ways. Different plants have different dominant states: A moss’s dominant stage is the gametophyte; a fern’s, the sporophyte. All seed plants (angiosperms) are sporophyte-dominant. Plants may be homosporous or heterosporous. Homosporous plants produce both male and female gametangia from the same gametophyte. Heterosporous plants may have the male and female spores occuring on the same flower or plant (monoecious), on different flowers or cones (pine) or even on different plants (dioecious, like gingkos). Seed plants are heterosporous and the seed grows from the female spore; the pollen, from the male. Plants may be vascular, containing cells which conduct water and solutes throughout the plant, or non-vascular. Plants may or may not flower. In haplodiplontic plants, alternation of generations refers to the reproductive cycle. The whole plant does not exist as a sporocyte and then disappear to reappear as a gametophyte, or vice versa. The less dominant phase exists on the dominant stage. A tree appears as a tree, which is its sporophyte stage. The gametophyte stage takes place on the various parts of the flowers or in the cones. Trees and bushes are vascular plants. Their dominant phase is the sporophyte. Heterosporous plants produce male microspores, so called because of their small size, which then form pollen grains. The much larger female megaspores form ovules. After fertilization by pollen, ovules become seeds, but this takes time, maybe two years. The differences between spores and seeds (both haploid) are summarized in the following table. Land plants are commonly divided into four major divisions, as shown in the following figure. Major divisions of plants, from Openstax College. The group of non-vascular plants, commonly called bryophtyes, includes moss, whose dominant stage is the haploid gametophyte. The sporophyte stage grows on the gametophyte plant. Moss is heterosporous and so produces male and female spores. 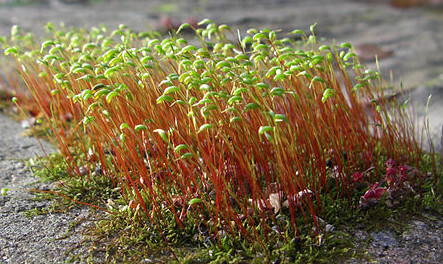 Moss with sporophytes, by James919 via Wikipedia. A fern is a seedless vascular plant and its dominant state is the diploid sporophyte. The tiny dark-colored objects under the fronds are spore-containing vessels called sori.6Singular, sorus. Ferns are homosporous and their gametophytes are independent of the sporophytes. Gymnosperms are non-flowering seed plants, like conifers or the gingko.7Also called at least in French, l’arbre des quarante écus. The tree is the diploid sporophyte phase. Conifers are heterosporous: The male gametophytes lives in the smaller, pollen cones lower on the tree; the female gametophyte is in the form of the harder, upper ovulate cones. Wind carries the pollen from the male cones to the female ones. Angiosperms, flower-bearing vascular plants, are also heterosporous and their dominant phase is also the diploid sporophyte. The male and female gametophytes are found in the flowers, in the anther and the ovary, as in the following figure. Angiosperms are fertilized through the rather complex process of double fertilization. 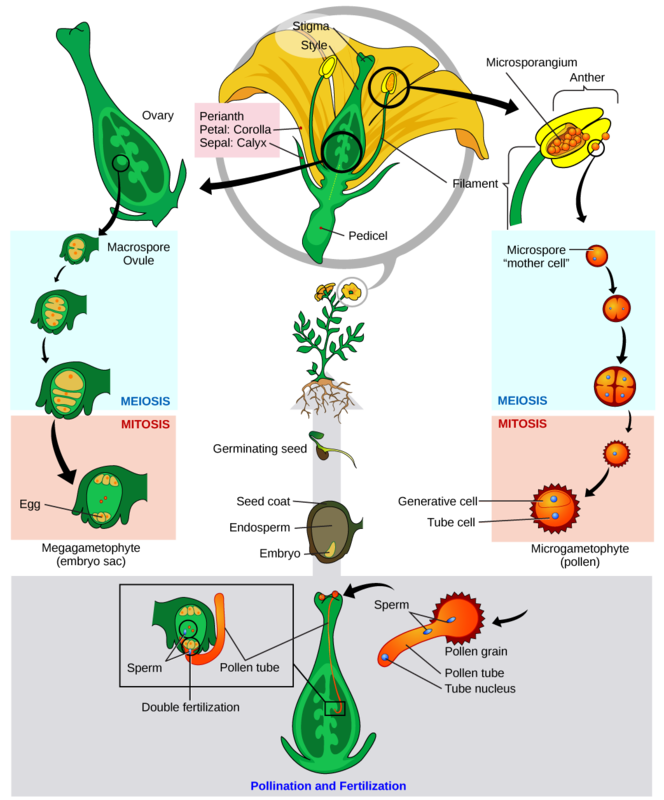 In the anther, on the stamen, male microsporocytes divide by meiosis to produce haploid microspores, which grow by mitosis to produce pollen grains, each of which contains two cells: one with two sperm and one which will grow a pollen tube. In the ovule, female megasporocytes develop similarly through division by meiosis and growth by mitosis to form the female gametophyte, the megagametophyte, or embryo sac. Typically, the embryo sac contains seven cells, one of which contains two nuclei and so is diploid. Of the other six haploid cells, one is the egg. When the pollen grain enters in contact with the embryo sac, it germinates, sending forth a pollen tube which extends into the embryo sac and allows passage of the two sperm cells. One fertilizes the egg. The other fertilizes the double-nucleus cell, forming a triploid nucleus, which later develops into food for the zygote and Is called the endosperm. On the wheat plant, the endosperm is the part we grind to make bread. The group of non-vascular plants, or bryophytes, is the oldest. Spores attributed to bryophytes date from the Ordovician, c. 490 Mya.1 Vascular plants appeared later, in the Silurian, c. 440 Mya. By the Late Devonian period (385 Mya) vascular plants had developed leaves and root systems. During the Carboniferous period (359-299 Mya), they grew to immense heights, and when they died, they were the basis for the fossil fuels we are burning today. Ferns became enormous during the Carboniferous. Gymnosperms probably appeared during the Carboniferous and were dominant in the Mesozoic Era (251-65.5 Mya). Angiosperms had become dominant by the middle of the Cretaceous period (145.5-65.5 Mya) and are still the most abundant of the plant groups. Biologists classify all life in a hierarchical system of classifications, or taxa. These classification schema have varied over time. Current stages of the classification for animals are shown in the figure. From the original two suggested kingdoms of 1735, we are now up to six in the latest suggested version.8There are various mnemonics for remembering the order. My favorite is “King Phillip came over for good spaghetti”. Other versions vary in the word “spaghetti”… This document will stick with the three – Bacteria, Archaea and Eucarya – we have been using so far. The system is most simply explained by some examples. Plant taxonomy is very different, using different terms for Domain, Phylum and Class, so we will skip them. Next, anatomy and physiology and bioenergetics. 1. ↑ Author’s work, based on Openstax BIology, itself modification of work by Peter Coxhead. 3. ↑ Note that this discussion concerns land plants only. 5. ↑ Author’s own work. 7. ↑ Also called at least in French, l’arbre des quarante écus.